Oregon Trail Card Game Unboxing - Don't Die of Dysentery Trying to Find It — GamingWithSwag.com - Dads By Day, Gamers By Night. 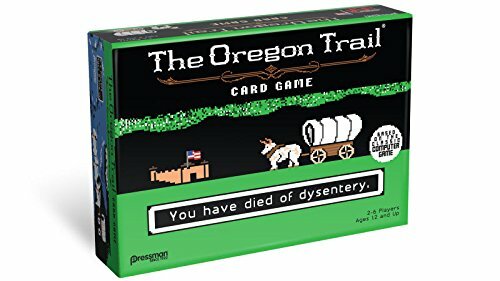 Quietly, as one would ford a river, the Oregon Trail Card Game was released at Target stores nationwide. As a Target exclusive, this retro-themed card game retails for $10.99 and is almost completely sold out everywhere. Based on the original educational software title that was produced for computers like the Apple IIe, the game features familiar events that occur while you are building your trail to reach beloved Oregon. Calamity cards are events that happen throughout the game. These include helpful cards like acquiring clean water and finding food, or some unfortunate events such as having a broken wheel on your caravan and of course dying of dysentery. Unfortunately, due to low stock, Target exclusivity, and scalpers looking to make a quick buck, this game has become near impossible to find. However, do not lose hope! You can always check the Target Inventory Checker and use the game's DCPI number (087-10-2911) to search your area for stock. If you have no other option, Amazon or Ebay sellers would be glad to sell you a copy at a premium. Take a look at our unboxing pictures video below to see what is in the box. Also, stay tuned as we record some play-through videos to see how much fun this game is! Make sure you head out to your local Target to find a copy as soon as possible, but don't die of dysentery trying to find it!